Welcome to our 800 sq.ft. 1 bedroom apartment! 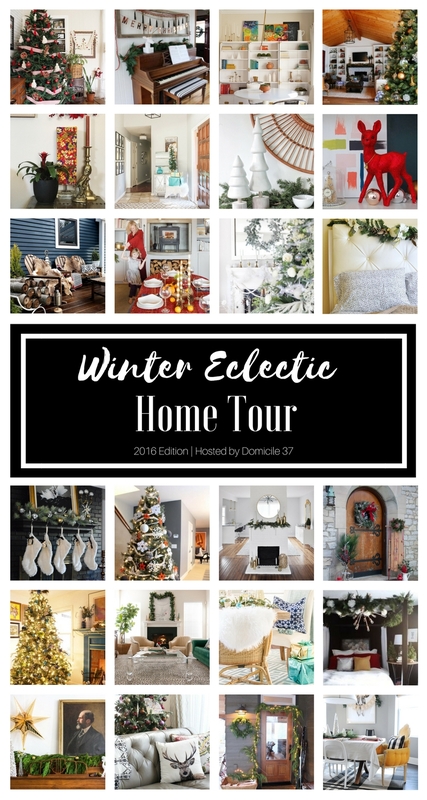 If you are arriving from French & French Interiors on the Winter Eclectic Home Tour hosted by Domicle 37, thank you so much for stopping by! No we are not decorated for Christmas just yet (I know, I know... LAME). I promise you I'm not a scrooge, just a procrastinator and we only just got our tree yesterday. But I am so grateful for the opportunity to share all the little changes we've made since the summer tour. Growing up, my family would always put a basket of special Christmas-only books under the tree to peruse in your PJ's at will. My favorite was an I Spy Christmas Edition. I kid you not, I've practically memorized all 13 double-page spreads plus the bonus round at the end! So even though I don't have oodles of holiday decor for you all, I thought I would (in my own way) invite you to join in on my beloved Christmas tradition and invite you play a rousing round of I Spy between my Summer and Winter Eclectic Home Tours. First, I finally brought home the killim pillows I had my eyes on since before we moved in last November (huzaah!) After waiting so long, I like the idea of leaving them out through the holiday season instead of switching them for something more obviously merry. Besides, I consider them my pillow children and it wouldn't be Christmas without them. Probably the biggest difference in the room is the big splurge of a rug. Weighing in at $250, I saved up for her for over a year and finally bought her from target last spring with some birthday money. The bonus is that Thor LOVES it - it's a high pile so he rolls around on it like it's real grass. Still hanging on the wall are the three drawers I rescued from a rotting desk on trash day. Below them is one of the suitcase tables I scored off Chelsea and the brass floor lamp of my dreams. If you looked closely, you may have noticed that the floor lamp is actually a change: I sold the old faux-gold one when I found this true vintage one for only $5! In addition to pillows, we also have many plant children (who for the most part are alive and well). We've added Figadora the Fiddle Leaf Fig to our sunny plant corner which is where we plan on putting the Christmas tree. (But don't tell Figadora - I honestly don't know how the fragile diva will take it). The smell has definitely subsided since it's had the chance to air out (and marinate in the fleet of Christmas-scented candles we light anytime someone's home). Unfortunately, the chair is not the most comfortable so I'm using it as a place holder until I find the perfect camel leather armchair or affordable sectional (even though that would mean also saying goodbye to my bestie the blue tufted sofa). Sharing the wall with our front door is our makeshift TV stand (also a roadside rescue) - another placeholder until I can convince Caleb we should get a proper piece of furniture that will allow me to hide the necessary evils (aka all our electronics). Next to the rug, the second most expensive item in the room actually is the little wooden set of drawers which was a recent find for a whopping $75. I answered a craigslist ad by an elderly gentleman who lives right around the corner from my parents. His listing wasn't very clear so when I arrived to pick up, I was pleasantly surprised that he had two for sale! So I impulsively shelled out double the money right then and there and have been using one as our new end table. Turns out the seller was a retired US Patent clerk and the unique design for these drawers dates back to 1903 - he actually had a the original patent on hand and sent me home with a copy! Behind the sofa is our dining room that always packs a colorful punch. In such a small space, the round table makes a huge difference for maximum maneuverability. The white triplet campaign bookshelves allow my feral love of color to really take over. Since they are a little on the short side, I have space above to prop artwork I can switch out at will. The clean, white finish is a nice contrast to my budding collections of books, minerals, terracotta pots, cloches, brass candlesticks, and moss balls. (I'm 99.9987% positive Caleb is rolling his eyes somewhere. At least they are all corralled in on place). Above the round table hangs my DIY 4-arm brass chandelier. Since we're in a rental, I used a recessed light conversion kit to retro fit the original can light. Since installing it, I've added elongated bulbs to play off the quirky angles. Hanging from our copper pipe curtain rod is a happy electric green pothos plant - which makes me smile every time I see it even though Caleb wrestles with it almost every time he tries to close the blinds. Past the bathroom and down the hallway is our one and only bedroom. Nope, we still don't have a headboard but we realized taking down the giant chartreuse curtain makes the room feel a lot brighter. For now, we've moved the Johann Steingruber 1773 "H" replica blueprint above the bed and I've started to tinker with abstract and geometric art on either nightstand. Flanking the bed are my entries to a friendly Flip Off competition against my sister-in-law and business partner Chelsea. She sold her flip, but I held on to mine for some extra bedroom storage. Above them are the brass swing arm sconces I rewired to plug-in (rental probs) which I snagged from a fellow DC furniture flipper for a steal! Opposite the window is my dresser and my beloved jewelry collection. I love being able to see all my accessories in the printer's drawer (even if it is a dust trap). Opposite the bed is Caleb's dresser - another thrifted MCM find. I found the waterfall mirror separately on Craigslist but it looks like it was made the dresser no? In the corner by the window is probably my favorite thrifted find: the brass + leather cantilever chair which sits next to my DIY mcm plant stand.